There are so many different ways to consume media these days whether it be through the television, billboards, social media, the internet, newspapers and magazines. You’d think with the vastness of these mediums that radio would be a thing of the past. Radio is thriving, which is brilliant news to the likes of myself who consumes many hours of radio every day of the week. From Radio 4 dramas to drivetime shows, the thing I love about radio is that you can be doing other things while absorbing it. Listeners are just spoilt for choice these days with the variety of commercial radio stations as well as the growth in BBC radio. However, I’m mainly listening to community radio stations these days. Because I’ve been bitten by the radio broadcasting bug. It’s true what they say about embracing every opportunity that comes along because you never know where it may take you. Five months ago I went along to a session with Wythenshawe FM in a small community centre in Baguley. I’d seen an advertisement on the noticeboard for my local supermarket asking if anybody was interested in attending training for either writing radio scripts, presenting, editing and features. So I went along thinking I could help them with the script writing. After all, I was in my final year of a masters degree in TV and Radio Scriptwriting so broadcasting credits are something that I’m looking for. It became apparent early on, that the other aspects that they were looking for were equally as important. I felt the colour drain from my face when the words “live broadcasting” were mentioned. It would be rude to get up and walk out at that point so I stayed for the entire session. But, at that point I had no intention of every broadcasting live – were they mad? I could barely talk to groups of people in work without fluffing my words, let alone a radio audience. Over the next few days I thought about it more and more. If something scares me I tend to do it anyway as I really enjoy the adrenalin of achieving something that terrifies me, “Feel the fear and do it anyway”. So, why not give it a go. The worst that can happen is that I freeze on air, and they can always fill in the space with a song. So I did it. On the 9 December 2013, I co-presented a show with another volunteer at Wythenshawe FM and I must admit the adrenaline from being on air live is something else. Once the initial “feeling like I’m going to have a heart attack” as my heart was pounding through my chest as I waited for my half an hour slot to begin, it was fine. After the live show in December, I carried on training with the radio station. We covered interview techniques, operating a Marantz, features, jingles, editing and then we had a number of sessions in the studio operating the desk. The studio sessions really baffled me, as it was one thing having to talk on air, but to also operate the desk and ensure that adverts were played, songs were queued and not to leave the microphone on. The other volunteers and myself all took it in turns to broadcast live for twenty or so minutes each week. This was probably the best way to learn, as we had an experienced member of staff with us all the way to make sure that we kept the station on air. At this point I was approached to see if I was interested in hosting my own radio show. I had to think about this one. It’s one thing to go on air with other people, but on my own and for an hour? What the hell have I possibly got to say for myself that would interest anybody in listening to me? So, I thought about it for thirty seconds and said yes, why not. I’m sure I could think of things to talk about without anybody saying anything back to me. I live with three males – I’m used to talking to myself. On 23 February 2014 The Sunday Matinee Show was first aired. 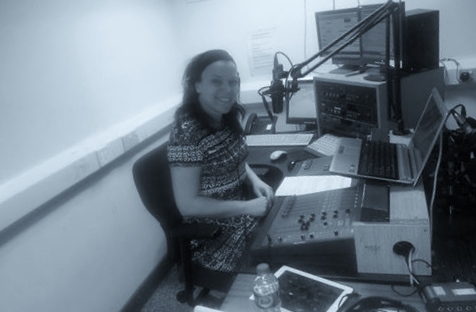 So, thank you Wythenshawe FM for giving me the opportunity to do something so out of my comfort zone that I would never have dreamed six months ago that I would be hosting my own show. ‘The Sunday Matinee Show’ is not only an entertainment show, but I also want to showcase up and coming local Manchester talent, whether it be writers, theatre companies, actors or musicians etc. This entry was posted in Blog, Radio, Writing and tagged blogging, community radio, radio drama series, scriptwriting, training, writing, Wythenshawe FM.